After an awful half-game in relief of the injured Brandon Shell last week, Brent Qvale had a much more settled performance this week, in his first start of the season at right tackle. In fact, in pass protection, Qvale didn't surrender any direct pressure, although this was in large part due to the fact they gave him the help he wasn't getting in his relief appearance against Houston. In the running game, the Jets didn't have any success running to the right side, although Qvale and Brian Winters exectuted a double team block well to seal the defensive end to the inside on a run that went for eight around the edge. The other nine runs over the right side went for just eight yards. For comparison, on 10 carries not over the right side, the Jets gained 31 yards. He was beaten at the point of attack on one other run, with his man slowing up the runner but unable to make the tackle in the backfield. That ended up gaining three. All in all, Qvale did a decent job filling in, which has usually been the case in the past. However, he did let himself down with a couple of lapses as he false started once and had a personal foul for a chop block that caused a fourth quarter drive to stall. With Rishard Matthews now on injured reserve and Quincy Enunwa out with an injury, Deontay Burnett was back in the line-up and saw his first offensive snaps since week nine. Burnett didn't register a reception, although he impressed with a spectacular diving catch out of bounds at the back of the end zone. His one other target was off his fingertips at the sideline on a wide throw. As a run blocker, Burnett had a couple of negative plays on the drive where the Jets had the ball with a 35-30 lead in the fourth quarter but ended up having to punt. 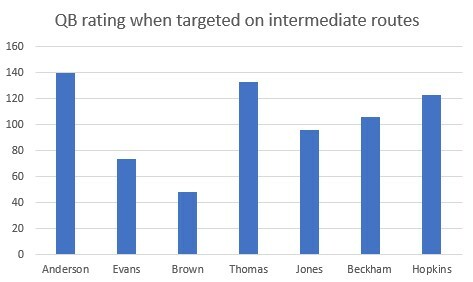 That perhaps offers a clue as to why the Jets were reluctant to put him in the line-up because his lack of size perhaps makes him a liability in blocking situations. Two plays after that, his man was able to blow up an outside run on the right side as he penetrated upfield and, despite slipping over, was able to get up and make the tackle in the backfield. Based on what he's shown so far, Burnett looks like a keeper and could develop nicely next year if he builds up his strength and this enables him to play with more physicality. One school of thought about Robby Anderson suggests he's just a deep threat, but in this game he posted a career high nine catches without catching a single deep ball. He also had a couple of catches on comebackers. These were routes Anderson was running and getting open on earlier in the season, but Darnold wasn't seeing it in time or timing his throws well enough to get him the ball.